"Bishop of Essex" redirects here. For the modern bishops of Essex, see Bishop of Chelmsford. Not to be confused with Coptic Orthodox Archbishop of London; Bishops of the Roman Catholic Diocese of London, Ontario; or Archbishop of Westminster. The Bishop of London is the ordinary of the Church of England Diocese of London in the Province of Canterbury. The diocese covers 458 km2 (177 sq mi) of 17 boroughs of Greater London north of the River Thames (historically the City of London and the County of Middlesex) and a small part of the County of Surrey (the district of Spelthorne, historically part of Middlesex). The see is in the City of London where the seat is St Paul's Cathedral which was founded as a cathedral in 604 and was rebuilt from 1675 following the Great Fire of London (1666). Third in seniority in the Church of England after the Archbishops of Canterbury and York, the bishop is one of five senior bishops who sit as of right as one of the 26 Lords Spiritual in the House of Lords (for the remaining diocesan bishops of lesser rank, seats are attained upon vacancy, determined by chronological seniority). The other four senior bishops are the Archbishop of Canterbury, the Archbishop of York, the Bishop of Durham and the Bishop of Winchester. The bishop's residence is The Old Deanery, Dean's Court, City of London. Previously, for over 1000 years, Fulham Palace was the residence and from the 18th century the bishop had chambers at London House next to the Bishop's Chapel in Aldersgate Street. The current (133rd) Bishop of London is Sarah Mullally. She was confirmed on 8 March 2018 after acting in post immediately after her canonical election on 25 January 2018. The diocesan bishop of London has had direct episcopal oversight in the Two Cities area (the City of London and the City of Westminster) since the institution of the London area scheme in 1979. 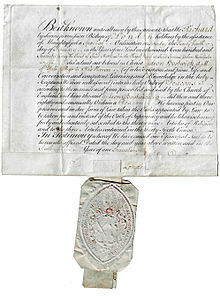 A certificate of ordination (with seal) given at Westminster by Richard Terrick, Bishop of London, 24 February 1770. The arms on the seal are blazoned: Per pale: 1. Gules, two swords in saltire points uppermost argent hilts and pommels or (for the office of the Bishop of London), and 2. ___ (the personal arms of Richard Terrick? ), surmounted by a bishop's mitre above an escallop. According to a 12th-century list, which may be recorded by Jocelyne of Furness, there had been 14 "archbishops" of London, claiming London's Christian community was founded in the 2nd century under the legendary King Lucius and his missionary saints Fagan, Deruvian, Elvanus, and Medwin. None of that is considered credible by modern historians but, although the surviving text is problematic, either Bishop Restitutus or Adelphius at the 314 Council of Arles seems to have come from Londinium. However, according to later sources, there had been 16 Romano-British "bishops" of London. The location of Londinium's original cathedral is uncertain. The present structure of St Peter upon Cornhill was designed by Christopher Wren following the Great Fire in 1666 but it stands upon the highest point in the area of old Londinium and medieval legends tied it to the city's earliest Christian community. In 1995, however, a large and ornate 4th-century church was discovered on Tower Hill, which seems to have mimicked St Ambrose's cathedral in the imperial capital at Milan on a still-larger scale. This possible cathedral was built between 350 and 400 out of stone taken from other buildings, including its veneer of black marble. It was burnt down in the early 5th century. Following the establishment of the archdiocese of Canterbury by the Gregorian mission, its leader St Augustine consecrated Mellitus as the first bishop to the Saxon kingdom of Essex. (The first bishop of Rochester was also consecrated the same year.) Bede records that Augustine's patron, King Æthelberht of Kent, built a cathedral for his nephew King Sæberht of Essex as part of this mission. This cathedral was constructed in "London" and dedicated to St Paul. Although it's not clear whether Lundenwic or Lundenburh was intended, it is generally assumed the church was located in the same place occupied by the present St Paul's Cathedral atop Ludgate Hill in London. Renaissance rumours that the cathedral had been erected over a Roman temple of the goddess Diana are no longer credited: during his rebuilding of the cathedral following the Great Fire of 1666, Christopher Wren reported discovering no trace of such a structure. Because the bishop's diocese includes the royal palaces and the seat of government at Westminster, he has been regarded as the "King's bishop" and has historically had considerable influence with members of the Royal Family and leading politicians of the day. Since 1748 it has been customary to appoint the Bishop of London to the post of Dean of the Chapel Royal, which has the amusing effect of putting under the bishop's jurisdiction, as dean, several chapels (at the Tower of London and St. James's Palace, among others) which are geographically in the Diocese of London but, as royal peculiars, are specifically outside the bishop's jurisdiction as bishop. The Bishop of London originally had responsibility for the church in the British colonies in North America, although after the American Revolution of 1776, all that remained under his jurisdiction were the islands of the British West Indies. The diocese was further reduced in 1846, when the counties of Essex and Hertfordshire were ceded to the Diocese of Rochester. The dates and names of these early bishops are very uncertain. 186 or unknown 193 or unknown Thean Also recorded as Theanus. Credited with foundation of St Peter upon Cornhill. unknown Cadar Also recorded as Cadwr and Cadoc. unknown Conan Also recorded as Conanus. unknown Palludius Also recorded as Palladius, "bishop of Britain". unknown Stephan Also recorded as Stephanus. unknown Iltuta Also recorded as Iltutus. Conflated with 5th-century St Illtud. unknown Dedwin Also recorded as Theodwin and Theodwinus. unknown Thedred Also recorded as Theodredus. unknown Hilary Also recorded as Hilarius. fl. 314 Restitutus Not included in Jocelyn's list, but one of three British bishops recorded attending the 314 Council of Arles. The text is corrupt, but either Restitutus or Adelphius seem to have come from London. None are listed as a metropolitan. unknown Guidelinus Also recorded as Guitelinus, mentioned in Geoffrey of Monmouth's History of the Kings of Britain. fl. c. 430 Fastidius Not included in Jocelyn's list; described as "bishop of the Britons" by Gennadius, who credits him with a work on Christian living (De Vita Christiana) and another on pious widowhood (De Virginitate); surviving texts by these names do not match Gennadius's description and seem rather Pelagian, although Gildas apparently quoted them approvingly. unknown c. 586 or unknown Theanus (II.) Also recorded as Theonus. Fled into Wales. According to one source, the last bishop's episcopate ended in 586. But according to another, a century and a half had elapsed between the flight of the last British bishop and the coming of the first Post-Augustinian bishop. 604 c. 617 Saint Mellitus Expelled circa 617. Translated to Canterbury in 619.
c. 653 664 Saint Cedd Became bishop possibly circa 653. Died in office, possibly on 26 October 664. 666 c. 672 Wine Also recorded as Wini. Translated from Winchester. Died in office, possibly before 672.
c. 675 693 Saint Earconwald Also recorded as Erconwald and Eorcenwald.. Formerly Abbot of Chertsey Abbey. Became bishop circa 675. Died in office. 693 betw. 705 & 716 Waldhere Also recorded as Wealdheri. Consecrated in 693 and died sometime between 705 and 716.
betw. 705 & 716 745 Ingwald Also recorded as Ingweald. 745 betw. 766 & 772 Ecgwulf Also recorded as Eggwulf. betw. 766 & 772 betw. 772 & 781 Wigheah Also recorded as Sighaeh. betw. 772 & 782 betw. 787 & 789 Eadberht Also recorded as Eadbert and Eadbeorht. betw. 793 & 796 betw. 796 & 798 Eadbald Also recorded as Eadbeald. betw. 796 & 798 801 Heathoberht Also recorded as Heathubeorht. betw. 801 & 803 betw. 805 & 811 Osmund Also recorded as Oswynus. betw. 805 & 811 betw. 816 & 824 Æthelnoth Also recorded as Æthilnoth. betw. 816 & 824 betw. 845 & 860 Ceolberht Also recorded as Coelbeorht. betw. 909 & 926 betw. 909 & 926 Leofstan Also recorded as Ealhstan and Elstanus. betw. 951 & 953 betw. 957 & 959 Brihthelm Also recorded as Beorhthelm. betw. 957 & 959 959 Dunstan Translated from Worcester. Translated to Canterbury. After his death he was canonised as Saint Dunstan. 996 1002 Wulfstan Translated to the sees of York and Worcester in 1002. 1014 c. 1035 Ælfwig Consecrated on 16 February 1014 and acceded to the bishopric sometime between 1015 and 1018. Died in office circa 1035. 1035 1044 Ælfweard Died in office on 25 or 27 July 1044. 1044 1051 Robert of Jumièges Previously Abbot of Jumièges Abbey. Appointed bishop in August 1044. Translated to Canterbury in 1051.
early 1051 Sept. 1051 (Spearhafoc) Previously Abbot of Abingdon. Appointed in early 1051, but never consecrated. Expelled in September 1051, fleeing with gold, gems and other valuable items from the diocesan stores. 1051 1075 William the Norman Consecrated in 1051. Died in office in 1075. 1075 1085 Hugh d'Orevalle Also recorded as Hugh D'Orival, Hugh de Orwell, and Hugh de Aurea Valle. Elected after 29 August 1075. Died in office on 12 January 1085. 1085 1107 Maurice Formerly Archdeacon of Le Mans and Lord Chancellor. Nominated or elected on 25 December 1085 and consecrated in 1086, possibly on 5 April. Died in office on 26 September 1107. 1108 1127 Richard de Beaumis I Elected on 24 May and consecrated on 26 July 1108. Died in office on 16 January 1127. His nephew, Richard de Beaumis II, was Bishop of London 1152–1162. 1127 1134 Gilbert Universalis Also known as Gilbert the Universal. Formerly a canon of Lyons. Elected circa December 1127 and consecrated on 22 January 1128. Died in office on 9 August 1134. 1136 1138 (Anselm of St Saba) Nephew of Archbishop Anselm of Canterbury. Benedictine monk, abbot of San Saba and Bury St Edmunds (1121–1148), and papal legate to England. Elected bishop c. 22 March 1136 and enthroned in 1137. However, his election was quashed by Pope Innocent II in 1138. 1141 1150 Robert de Sigello Formerly a monk of Reading Abbey. Nominated by Empress Matilda in July 1141 and consecrated before April 1142 (probably in July 1141). Died in office on 28 or 29 September 1150. 1152 1162 Richard de Beaumis II Formerly Archdeacon of Middlesex. Consecrated bishop on 28 September 1152. Died in office on 4 May 1162. His uncle, Richard de Beaumis I, was Bishop of London 1108–1127. 1189 1198 Richard FitzNeal Also known as Richard FitzNigel. Lord High Treasurer (c.1158–1196) and Dean of Lincoln (1183–1189). Nominated bishop on 15 September and consecrated on 31 December 1189. Died in office on 10 September 1198. 1198 1221 William of Sainte-Mère-Eglise Also known as William de St Mariæ Ecclesiâ. Formerly a Prebendary of St Paul's, London. Elected after 7 December 1198 and consecrated on 23 May 1199. Resigned on 25 or 26 January 1221. Died on 24 or 27 March 1224. 1221 1228 Eustace of Fauconberg Formerly a Prebendary of St Paul's, London. Elected on 26 February, received the temporalities on 23 March, and consecrated 25 April 1221. Also Lord High Treasurer (1217–1228). Died in office sometime between 24 and 31 October 1228. 1228 1241 Roger Niger Formerly Archdeacon of Colchester (1218–1229). Elected in 1228, received the temporalities on 27 April 1229, and consecrated on 10 June 1229. Died on office on 29 September 1241. After his death he was revered as a saint, although there is no formal record of his canonisation. 1241 1259 Fulk Basset Formerly Dean of York (1239–1241). Elected circa December 1241, received the temporalities on 16 March 1244, and consecrated on 9 October 1244. Died in office on 21 May 1259. 1259 1262 Henry Wingham Also known as Henry of Wingham. Formerly a Prebendary of St Paul's, London, Dean (Dean of St Martin's le Grand, and Lord Chancellor. Elected before 29 June 1259, received the temporalities on 11 July 1159, and consecrated on 15 February 1260. Died in office on 13 July 1262. Aug. 1262 Sept. 1262 (Richard Talbot) Formerly Dean of St Paul's, London. Elected on 18 August 1262, but died unconsecrated on 28 September 1262. 1262 1272 Henry of Sandwich Formerly a Prebendary of St Paul's, London. Elected on 13 November 1262, received the temporalities on 15 January 1263, and consecrated on 27 May 1263. Died in office on 15 September 1272. 1273 1280 John Chishull Formerly Lord High Treasurer, Lord Chancellor and Dean of St Paul's, London. Elected on 7 December 1273, received the temporalities on 15 March 1274, and consecrated on 29 April 1274. Died in office on 7 February 1280. Feb. 1280 Apr. 1280 (Fulke Lovell) Archdeacon of Colchester (c. 1263–1285) and Prebendary of St Paul's, London. Elected Bishop of London after 18 February, but was never consecrated. Resigned before 8 April 1280. 1280 1303 Richard Gravesend Formerly a Prebendary of St Paul's, London. Elected before 7 May, received the temporalities on 17 May, and consecrated on 11 August 1280. Died in office on 9 December 1303. 1304 1313 Ralph Baldock Also known as Ralph de Baldoc. Formerly Dean of St Paul's, London (1294–1306). Elected on 24 February 1304, received the temporalities on 1 June 1304, and consecrated on 30 January 1306. Died in office on 24 July 1313. 1313 1316 Gilbert Segrave Formerly Precentor of St Paul's, London (c.1306–1316). Elected on 17 August, received the temporalities on 28 September, and consecrated on 25 November 1313. Died in office on 18 December 1316. 1317 1318 Richard Newport Formerly Dean of St Paul's, London (1316–1317). Elected on 27 January, received the temporalities on 31 March, and consecrated on 15 May 1317. Died in office on 24 August 1318. 1318 1338 Stephen Gravesend Formerly a Prebendary of St Paul's, London. Elected on 1 September 1318, received the temporalities on 6 November 1318, and consecrated on 14 January 1319. Died in office on 8 April 1338. 1338 1339 Richard de Wentworth Also known as Richard Bintworth. Formerly a Prebendary of St Paul's, London and Lord Privy Seal (1337–1338). Elected on 4 May, received the temporalities on 24 May, and consecrated on 12 July 1338. Also Lord Chancellor (1338–1339). Died in office on 8 December 1339. 1340 1354 Ralph Stratford Formerly Treasurer of Salisbury (1336–1340). Elected on 26 January, received the temporalities on 13 February, and consecrated on 12 March 1340. Died in office on 17 April 1354. 1354 1361 Michael Northburgh Formerly a Prebendary of Lichfield (1342–1354). Elected on 22 April 1354, appointed on 7 May 1354, received the temporalities on 23 June 1354, and consecrated on 12 July 1355. Died in office on 9 September 1361. 1361 1375 Simon Sudbury Also called Simon Theobald of Sudbury and Simon of Sudbury. Formerly Chancellor of Salisbury (c.1353–1361). Appointed on 22 October 1361, consecrated on 20 March 1362, and received the temporalities on 15 May 1362. Translated to Canterbury on 4 May 1375. 1375 1381 William Courtenay Translated from Hereford. Appointed on 12 September and received the temporalities on 2 December 1375. Also Lord Chancellor (August–December 1381). Translated to Canterbury on 9 September 1381. 1381 1404 Robert Braybrooke Formerly Dean of Salisbury (1379–1381). Appointed on 9 September and received the temporalities on 27 December 1381. Consecrated on 5 January 1382. Also Lord Chancellor (1382–1383). Died in office on 28 August 1404.
c. Oct. 1404 c. Dec. 1404 (Thomas Langley) Keeper of the Privy Seal (1401–1405) and Dean of York (1401–1406). Elected bishop circa October 1404, but his installation was refused by Pope Innocent VII. Afterwards became Lord Chancellor (1405–07 and 1417–24) and Bishop of Durham (1406–1437). 1404 1406 Roger Walden Previously Archbishop of Canterbury (1398–1399). Appointed on 10 December 1404 and received the temporalities on 28 July 1405. Died in office on 6 January 1406. 1406 1407 Nicholas Bubwith Also known as Nicholas de Bubbewyth. Formerly Master of the Rolls (1402–1405) and Keeper of the Privy Seal (1405–1406). Appointed on 14 May, consecrated on 26 September, and received the temporalities on 27 September 1406. Also Lord Treasurer (1407–1408). Translated to Salisbury on 22 June 1407. 1407 1421 Richard Clifford Translated from Worcester. Appointed on 22 June and received the temporalities on 20 October 1407. Died in office on 20 August 1421.
elected 1421 (Thomas Polton) Bishop of Hereford (1420–1421). Elected Bishop of London in 1421, but was set aside and instead translated to the bishopric of Chichester on 17 November 1421. 1421 1425 John Kemp Translated from Chichester. Appointed on 17 November 1421 and received the temporalities on 20 June 1422. Translated to York on 20 July 1425. 1425 1431 William Grey Formerly Dean of York (1420–1425). Appointed on 20 July 1425, elected on 8 April, received the temporalities on 6 May, and consecrated on 26 May 1426. Translated to Lincoln on 30 April 1431. 1431 1436 Robert FitzHugh Formerly Archdeacon of Northampton (1419–1431) and Chancellor of Cambridge University (1424–1426). Appointed on 20 April, received the temporalities on 4 August, and consecrated on 16 September 1431. Died in office on 15 January 1436. 1436 1448 Robert Gilbert Formerly Dean of York (1426–1436). Elected bishop on 23 February, appointed on 21 May, received the temporalities on 15 September, and consecrated on 28 October 1436. Died in office before 27 July 1448. 1448 1489 Thomas Kempe Formerly Archdeacon of Middlesex and Chancellor of York. Appointed on 21 August 1448, received the temporalities on 6 February 1450, and consecrated on 8 February 1450. Died in office on 28 March 1489. 1489 1496 Richard Hill Formerly Archdeacon of Lewes and Dean of King's Chapel. Appointed on 21 August, received the temporalities on 6 November, and consecrated on 15 November 1489. Died in office on 20 February 1496. 1496 1501 Thomas Savage Translated from Rochester. Appointed on 3 August and received the temporalities on 2 December 1496. Translated to York before 12 August 1501. 1501 1503 William Warham Formerly a Prebendary of St Paul's, London. Appointed on 20 October 1501, consecrated on 25 September 1502, received the temporalities on 1 October 1502. Also Keeper of the Great Seal (1502–1504). Translated to Canterbury on 29 November 1503. 1504 1505 William Barons Formerly Master of the Rolls (1502–1504). Elected bishop before 2 August 1504 and appointed on that date. Received the temporalities on 13 November and consecrated on 26 November 1504. Died in office on 10 October 1505. 1506 1522 Richard FitzJames Translated from Chichester. Nominated on 24 March, appointed on 5 June, and received the temporalities on 1 August 1506. Died in office before 17 January 1522. 1522 1530 Cuthbert Tunstall Formerly Dean of Salisbury (1521–1522) and Master of the Rolls (1516–1522). Nominated in January and appointed on 16 May 1522 (again on 10 September 1522). Received the temporalities on 7 October and consecrated on 19 October 1522. Translated to Durham on 21 February 1530. John Stokesley Formerly Archdeacon of Dorset (1523–1530). Appointed on 28 March, received the temporalities on 14 July, and consecrated on 27 November 1530. Died in office on 8 September 1539. Edmund Bonner (1st term) Formerly Archdeacon of Leicester (1535–1539) and Bishop-elect of Hereford (1538–1539). Elected Bishop of London on 20 October 1539 and consecrated on 4 April 1540. Deprived on 1 October 1549. Nicholas Ridley Translated from Rochester. Nominated on 1 April 1550. Styled Bishop of London and Westminster. Deprived in July 1553 and burned at the stake for heresy on 16 October 1555. Edmund Bonner (2nd term) Restored on 5 September 1553, but deprived again on 29 May 1559 for refusing to take the Oath of Supremacy. Died in Marshalsea Prison on 6 September 1569. Edmund Grindal Nominated on 22 June and consecrated on 21 December 1559. Also Master of Pembroke Hall, Cambridge (1559–1561). Translated to York on 22 May 1570. Edwin Sandys Translated from Worcester. Nominated on 1 June and confirmed on 13 July 1570. Translated to York on 8 March 1577. John Aylmer Formerly Archdeacon of Lincoln (1562–1577). Nominated on 23 February and consecrated on 24 March 1577. Died in office on 5 June 1594. Richard Fletcher Translated from Worcester. Nominated on 26 December 1594 and confirmed on 10 January 1595. Died in office on 15 June 1596. Richard Bancroft Formerly a canon of Westminster (1592–1597) and Canterbury (1595–1597). Elected on 21 April and consecrated on 8 May 1597. Translated to Canterbury on 10 December 1604. Richard Vaughan Translated from Chester. Nominated on 8 December and confirmed on 20 December 1604. Died in office on 30 March 1607. Thomas Ravis Translated from Gloucester. Nominated before 14 April and confirmed on 18 May 1607. Died in office on 14 December 1609. George Abbot Translated from Lichfield & Coventry. Nominated on 24 December 1609 and confirmed on 20 January 1610. Translated to Canterbury on 9 April 1611. John King Formerly Dean of Christ Church, Oxford (1605–1611). Nominated on 30 April and consecrated on 8 September 1611. Died in office on 30 March 1621. George Montaigne Translated from Lincoln. Nominated on 26 June and confirmed on 20 July 1621. Translated to Durham after 19 February 1628. William Laud Translated from Bath & Wells. Nominated on 4 July and confirmed on 15 July 1628. Also Chancellor of the University of Oxford (1630–1641). Translated to Canterbury on 19 September 1633. William Juxon Formerly Bishop-elect of Hereford. Nominated Bishop of London on 23 October and consecrated on 27 October 1633. Also Lord Treasurer (1636–1641). Deprived of the see when the English episcopacy was abolished by Parliament on 9 October 1646. Following the Restoration of the monarchy, Juxon was translated to Canterbury on 20 September 1660. Gilbert Sheldon Previously a canon of Gloucester (1633–1658). Nominated on 21 September and consecrated on 28 October 1660. Translated to Canterbury on 31 August 1663. Humphrey Henchman Translated from Salisbury. Nominated on 16 June and confirmed on 15 September 1663. Also Lord High Almoner (1662–1675). Died in office on 7 October 1675. Henry Compton Translated from Oxford. Nominated on 6 December 1675 and confirmed on 6 February 1676. Died in office on 7 July 1713. John Robinson Translated from Bristol. Nominated on 8 August 1713 and confirmed on 13 March 1714. Died in office on 11 April 1723. Edmund Gibson Translated from Lincoln. Nominated on 10 April and confirmed on 4 May 1723. Died in office on 4 September 1748. Thomas Sherlock Translated from Salisbury. Nominated on 12 October and confirmed on 1 December 1748. Died in office on 18 July 1761. Thomas Hayter Translated from Norwich. Nominated on 19 September and confirmed on 24 October 1761. Died in office on 9 January 1762. Richard Osbaldeston Translated from Carlisle. Nominated on 30 January and confirmed on 18 February 1762. Died in office on 13 May 1764. Richard Terrick Translated from Peterborough. Nominated on 22 May and confirmed on 6 June 1764. Died in office on 29 March 1777. Robert Lowth Translated from Oxford. Nominated on 12 April 1777 and confirmed on 1 May 1778. Died in office on 3 November 1787. Beilby Porteus Translated from Chester. Nominated on 14 November and confirmed on 7 December 1787. Died in office on 14 May 1809. John Randolph Translated from Bangor. Nominated on 25 May and confirmed on 9 August 1809. Died in office on 28 July 1813. William Howley Nominated on 12 August and confirmed 1 October 1813. Translated to Canterbury on 15 August 1828. Charles James Blomfield Translated from Chester. Nominated on 15 August and confirmed on 23 August 1828. Resigned due to ill-health on 30 September 1856 and died on 5 August 1857. Archibald Campbell Tait Formerly Dean of Carlisle (1849–1856). Elected bishop on 28 October and consecrated on 23 November 1856. Translated to Canterbury on 30 December 1868. John Jackson Translated from Lincoln. Nominated on 11 January and confirmed on 29 January 1869. Died in office on 6 January 1885. Frederick Temple Translated from Exeter. Nominated on 26 February and confirmed on 24 March 1885. Translated to Canterbury on 22 December 1896. Mandell Creighton Translated from Peterborough. Nominated on 31 December 1896 and confirmed on 15 January 1897. Died in office on 14 January 1901. Arthur Winnington-Ingram Translated from Stepney. Nominated on 16 March and confirmed on 17 April 1901. Resigned on 1 September 1939 and died on 26 May 1946. Geoffrey Fisher Translated from Chester. Nominated on 14 September and confirmed on 17 October 1939. Translated to Canterbury on 2 February 1945. William Wand Translated from Bath and Wells. Nominated on 10 July and confirmed on 22 August 1945. Resigned in November 1955 and died on 16 August 1977. Translated from Guildford. Nominated on 10 January and confirmed on 25 January 1956. Resigned on 31 July 1961 and died on 26 December 1970. 1961 1973 Robert Stopford Translated from Peterborough. Nominated on 4 August and confirmed on 25 September 1961. Resigned on 11 June 1973 and died on 13 August 1976. Gerald Ellison Translated from Chester. Nominated on 18 June and confirmed on 16 July 1973. Resigned on 30 April 1981 and died on 18 October 1992. Graham Leonard Translated from Truro. Nominated on 28 May and confirmed on 21 July 1981. After his resignation in 1991, he became a Roman Catholic priest in 1994. Died on 6 January 2010. David Hope Translated from Wakefield. Nominated and confirmed in 1991. Translated to York in 1995. Richard Chartres Translated from Stepney. Elected in October and confirmed in November 1995. Retired on 28 February 2017. Bishop of Willesden Acting diocesan bishop during vacancy. ^ Noorthouck, John (1773), "Book 2, Ch. 4: Aldersgate Ward", A New History of London Including Westminster and Southwark, London: R Baldwin, pp. 543-545. ^ "4: The Dioceses Commission, 1978–2002" (PDF). Church of England. Archived from the original (PDF) on 7 June 2012. Retrieved 23 April 2013. ^ a b Stowe 1605, p. 37. ^ Labbé & Cossart 1671, Volume 1, Item de Galliis. ^ Thackeray 1843, p. 275. ^ a b c d e f g h i j k l m n o p q r Parker, John. The Works of Dionysius the Areopagite, Now First Translated into English, From the Original Greek, Appendix: "List of Bishops". James Parker& Co. (London), 1897. ^ a b c d e f g h i j k l m n o p Herbermann, Charles, ed. (1913). "London" . Catholic Encyclopedia. New York: Robert Appleton Company. ^ Denison, Simon (June 1995). "News: In Brief". British Archaeology. Council for British Archaeology. Archived from the original on 13 May 2013. Retrieved 30 March 2013. ^ Sankey, D. (1998). "Cathedrals, granaries and urban vitality in late Roman London". In Watson, Bruce (ed.). Roman London: Recent Archaeological Work. JRA Supplementary Series. 24. Portsmouth, RI: Journal of Roman Archaeology. pp. 78–82. ^ Clark 1996, pp. 1—9. ^ a b c d e f g h i j k l m "Historical successions: London". Crockford's Clerical Directory. Retrieved 1 February 2012. ^ Geoffrey of Monmouth. History of the Kings of Britain, Vol. IV, Ch. ii–vi. ^ Gennadius of Marseilles De Viris Illustribus, Ch. lvii. (in Latin) Translated by Ernest Cushing Richardson in A Select Library of the Nicene and Post-Nicene Fathers of the Christian Church, 2nd Series, Translated into English with Prolegomena and Explanatory Notes, Vol. III, Lives of Illustrious Men, Ch. LVII: "Fastidius the bishop". T. & T. Clark (Edinburgh). Reprinted by Wm. B. Eerdman's Publishing (Grand Rapids). ^ Pseudo-Fastidius. "On Virginity" and "On the Christian Life". Translated by B.R. Rees in The Letters of Pelagius and His Followers. 1991. Reprinted as Pelagius: Life and Letters", Vol. II, Pt. I, Ch. 2 & 4, pp. 71–87 & 105–126. The Boydell Press (Woodbridge), 1998. ISBN 978-0-85115-714-6. ^ Bonwetsch, N. (1907). "Fastidius". Schaff–Herzog Encyclopedia of Religious Knowledge. Archived from the original on 25 February 2015. Retrieved 25 February 2015. ^ Herren, Michael W. & al. Christ in Celtic Christianity, pp. 80–81. The Boydell Press (Woodbridge), 2002. ISBN 0-85115-889-7. ^ Fryde et al. 2003, pp. 219–220. ^ a b c d Noorthouck 1773, pp. 899–900. ^ Fryde et al. 2003, pp. 258–259. ^ Fryde et al. 2003, p. 259. ^ Plant, David (2002). "Episcopalians". BCW Project. Retrieved 20 August 2011. ^ Fryde et al. 2003, pp. 259–260. Clark, John (1996). "The Temple of Diana". In Bird, Joanna; Hassall, Mark; Sheldon, Harvey (eds.). Interpreting Roman London. Oxbow Monograph. 58. Oxford: Oxbow. pp. 1–9. Greenway, D. E. (1968). St. Paul's, London. British History Online. Fasti Ecclesiae Anglicanae 1066–1300. Volume 1. London: Institute of Historical Research. Retrieved 23 February 2015. Horn, J. M. (1963). St Paul's, London. British History Online. Fasti Ecclesiae Anglicanae 1300–1541. Volume 5. London: Institute of Historical Research. Retrieved 23 February 2015. Horn, J. M. (1969). St. Paul's, London. British History Online. Fasti Ecclesiae Anglicanae 1541–1857. Volume 1. London: Institute of Historical Research. Retrieved 23 February 2015. Labbé, Philippe; Cossart, Gabriel, eds. (1671). Sacrosancta Concilia ad Regiam Editionem Exacta: quae Nunc Quarta Parte Prodit Actior [The Sancrosanct Councils Exacted for the Royal Edition: which the Editors Now Produce in Four Parts] (in Latin). Volume 1. Paris: Lutetiae Parisiorum: Impensis Societatis typographicae librorum ecclesiasticorum jussu regis constitutae. Column 1430, Item de Galliis. Retrieved 23 February 2015. Noorthouck, John (1773). A New History of London – Including Westminster and Southwark. British History Online. Retrieved 23 February 2015. Stowe, John (1605). The Annales of England. London: G. Bishop & T. Adams. p. 37. Retrieved 23 February 2015. Thackeray, Francis (1843). Researches into the ecclesiastical and political state of Ancient Britain under the Roman Emperors, with observations upon the principal events and characters connected with the Christian religion during the first five centuries (in Latin and English). Volume 1. London: Thomas Cadell, Strand. p. 275. Retrieved 23 February 2015.